Discussion in 'Auto News' started by RocZX, Jan 30, 2019. Full details will be announced soon, with highlights including carbon monocoque, full carbon fibre body, 600+ BHP naturally aspirated V8 billet engine designed and manufactured in-house, sequential gearbox and race-derived aerodynamic package. IngRobNy and GT HP Nut like this. That screenshot from Supercar Street Challenge is really impressive. GranTurismo guy, Doomotron, letsdothis97 and 7 others like this. For clarification the new Le Mans Hypercar class has nothing to do with road going cars. They will all be purpose built and not derived from a road car. They will all be purpose built and not derived from a road car. That's rather up to the manufacturer. One of points of the category is to have race cars more closely resembling road cars. The FIA/ACO will regulate the power units and aerodynamic performance, but not the chassis and broader body shape - so that the cars can look like a manufacturer's road cars. 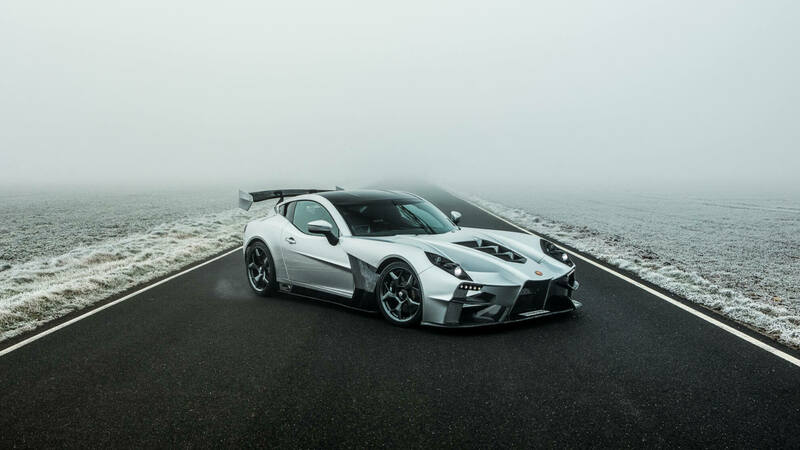 In any case, the carbon-fibre tub the new Ginetta will use isn't exactly that far removed from the one the Ginetta LMP1 car uses (among other LMP1 and LMP2 cars, and a lot of GTE cars too), and it doesn't seem unreasonable to speculate that the hypercars will also use. There's no particular reason to directly derive the car from a road car (or build a road car version of the race car), but there's also no particular reason why someone can't. Leggacy and potvinsuks like this. Eh, I sincerely doubt we'll see road legal versions of these cars. There is a reason why they wouldn't, and history shows it with the apparently fully road legal Toyota GT-One. Granted, its badge would hold it back but its extreme performance and looks should make it sell, right? But they only made one. They didn't even make it available as a one (just-a-few) off, selling it to those willing to fork out the money. I don't think now it'll be different. Specially as, like you said, there's no need to do it. But that's kind of like now, you could make a road car out of a current LMP tub, I'm sure they said on Midweek Motorsport in an interview with some one from the ACO that you couldn't turn say a Senna or a AMG Project one into one of the new hypercar class. Essentially the chassis rules will be similar to what they are now but with a better (for the drivers back) driving position and a larger greenhouse. I think a lot of the website have gotten it wrong as they all think we will see modified Sennas and Valkyries racing and that's not what the rules are. Ultimately there's no real reason why you can't see a Senna, or a ONE (I really hope Mercedes does something about that name), or a Valkyrie in the hypercar class, it's just a case of how reasonable a prospect it is. ... only you need to have a 268hp electric motor driving the front wheels too. That's sort-of-fine for the Mercedes and the Aston, but there's no way to package that in a Senna, much less the (minimum) 154lb battery pack it needs. That Toyota thing we wrote about a while back might be pretty close to the formula, and it's not terribly unfeasible as a road car - as noted earlier with the TS020. Yes, Toyota only made one back then, but that was the rule at the time. This article was published by Andrew Evans (@Famine) on February 27th, 2019 in the Automotive News category. All I can say is, from the company that made the cool looking G40, G50 and G55, I like that G4 in the pic. GETEDA and kilesa4568 like this. Donniebrasko and letsdothis97 like this. What is it even trying to look like? Its as if its trying to look like many different cars at once. Michael88 and MrSayAnythang like this. It looks like a braham bt62 up front, body profile of a c7 zr1 and rear end of a Jensen interceptor all meshed together. Looks like an LMP front end welded onto the back of a GT. I have to say I don't care if it can do 200mph. Its rank. At first I thought it was a 21st century rendition of the Panoz GTR-1 from looking at the front end. Scuderia Paul and Dsavage27 like this. Looks like something out of the old Burnout games. I'm getting GT-R LM NISMO vibes from it. It's not exactly elegant right now... But if they got rid of all the spoilers and splitters and stuff, it could actually be an interestingly-designed grand-tourer. 05XR8, CLowndes888, Scuderia Paul and 1 other person like this. What an ugly car but somehow, I like it. It is great to see a company like Ginetta making cars at this level. I was fairly hyped to see this car but, having seen the styling, I am hugely disappointed. This is a seriously ugly thing. It will no doubt be a fine performer but it ain't a looker. $525,000 is an asking price which puts you in with some serious competition so I hope it is a success for Ginetta. Majority of cars are becoming uglier by the year I dont get it lol. I guess manufacturers are running out of ideas. It's like they were trying to do a Veneno and then gave up half way. Very odd considering their other cars are quite beautiful like the G40. Wow, that's more than just a little bit ugly. MrSayAnythang and Leggacy like this. Looks like they crashed a Vulcan. Though it looks to be a mighty impressive car. It looks like a GTE ready machine. Have you guys seen the location of the engine? GETEDA, LeGeNd-1, Robin and 1 other person like this. Going to be a nice cabin heater! EngieDiesel, Robin, lancia delta hf and 6 others like this.